The Brisbane Writers Festival (BWF 2015) is over for another year. I was fortunate to be able to get to a couple of the sessions on the Thursday and Friday – a masterclass with US short story writer, Kelly Link, and another with researcher and biographer, Karen Lamb. I bought a copy of Kelly’s latest book of short stories, Get in trouble (Text Publishing, 2015), and when she signed it she warned me that the stories had ‘pretty weird endings’. I’m looking forward to reading it. I have a few things in common with Karen Lamb – she’s a researcher and biographer, she teaches at a university in Brisbane, and she likes structure in her teaching. So she had a timetable for the masterclass. The value of the class for me was that it gave me new insights into my current draft about the ‘Chalkies’ in Papua New Guinea 1966-73 (see previous blog). Also, Karen mentioned a book by an American writer, the intriguingly named Francine Prose, Reading Like a Writer (Harper Collins, 2006), described as ‘A guide for people who love books and for those who want to write them’, which could be worth a look. 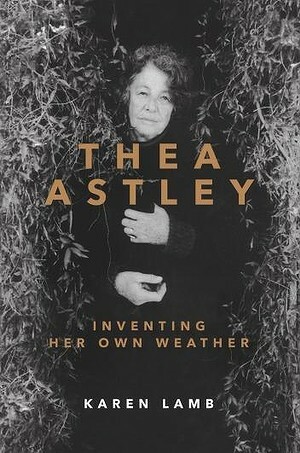 I bought a copy of Karen’s biography, Thea Astley: Inventing her own weather (University of Queensland Press, 2015), because I’m interested to see how she wrote it, and I also like supporting fellow writers as well as an independent bookshop (State Library of Queensland). There were other potentially fascinating sessions at BWF, but apart from having family commitments over the weekend, I also reach a point at such events where I need to get back to my own writing rather than continue to hear other writers talk about theirs. I strongly support the adage that the best thing a writer can do is write! As a long-time educator as well as writer, I believe external input, whether through writers’ festivals, self-help guides or online tips, can be very helpful, especially if it’s timely, but it can also be an excuse for procrastination. Mary Norris is a copy-editor at the well-known The New Yorker magazine, which publishes news stories, short stories, essays, cartoons, poetry, etc, and includes an audience well outside its host city. It’s also well-known, if not notorious, for its rigorous copy-editing, and Mary Norris is one of the enforcers. This non-fiction book is part memoir, part discussion of points of punctuation and grammar, often humourously expressed, and sometimes self-deprecating. Nevertheless, there are clearly standards of English expression to be upheld, and Ms Norris shows she believes has a responsibility as a standard-bearer. She does not brook the use of dangling participles, for example, once objecting to this construction from an author: ‘Over tea in the greenhouse, her mood turned dark’, and she rejects outright the use of ‘their’ in place of ‘his and/or her’. Mary Norris also uses only No. 2 pencils for hard-copy editing and if someone accidentally leaves a No. 1 pencil on her desk and she picks it up, she knows immediately it is not hers, and throws it in her desk drawer. Part of her story is about being able to find a reliable supply of No. 2 pencils. You get the picture. In between, the author gives us a fascinating insight into the backrooms of The New Yorker and her fellow editors, including Lu, who ‘patrolled the halls like a prison warden’. On Lu’s desk sat a small canister she called a ‘comma shaker’, to express her distaste for what she saw as The New Yorker’s over-use of commas. Between you and me: Confessions of a comma queen is an enjoyable read, and some of Mary Norris’s punctuation examples are guaranteed to provoke discussion among people who care about the use of language. I just hope she doesn’t run her No. 2 pencil over my blog. This entry was posted in Ageing, Biography, Books, creative non-fiction, Editing, Encore careers, Fiction, History, Libraries, narrative non-fiction, non-fiction, Non-fiction writing, Novels, self-improvement, short story writing, Uncategorized, Writing by Darryl R Dymock. Bookmark the permalink. You make such a good point about only being able to listen to others (or read books about writing) for so long – enough to inspire you, but not enough to take up all your writing time! The book you read sounds fab – I love The New Yorker and read it all the time.